Ninu fisiksi eleruku, awon bosoni ( /ˈboʊsɒn/) je eruku inuatomu pelu nomba odidi spin (s = 0, 1, 2 etc.) ti won tele ilana statistiki Bose-Einstein. Oruko bosoni wa latowo Paul Dirac lati se eye fun ipa ti asefisksi ara India Satyendra Nath Bose, pelu Albert Einstein, ko ninu idasile statistiki Bose-Einstein—arojinle to unselana ninu eyi. Ninu awon Bosoni ni bosoni Higgs (s=0), awon mesoni (s=0,1), grafitoni aladalaba (s=2), iyewu adurosinsin nomba akojo didogba (f.a., deuterium, helium-4, lead-208)[Akiyesi 1] ati awon aruku to pondandan lati se papa arojinle papa oniyebintin bi awon fotoni, awon gluoni, at.b.b.lo. Awon bosoni yato gidigidi si awon eka eruku inu atomu ti a mo si fermioni nibi pe ko si opin si iye to le wa ni aye oniyebintin kanna. Iwa yi, fun apere, lo unfa ini pataki helium-4 nigba to ba je titutu de superfluid. 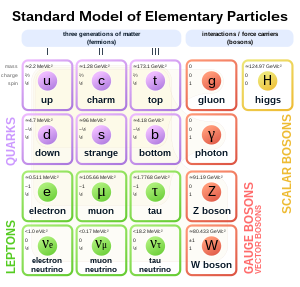 Bosons contrast with fermions, which obey Fermi–Dirac statistics. Two or more fermions cannot occupy the same quantum state (see Pauli exclusion principle). Since bosons with the same energy can occupy the same place in space, bosons are often force carrier particles. In contrast, fermions are usually associated with matter (although in quantum physics the distinction between the two concepts is not clear cut). All observed bosons have integer spin, as opposed to fermions, which have half-integer spin. This is in accordance with the spin-statistics theorem, which states that in any reasonable relativistic quantum field theory, particles with integer spin are bosons, while particles with half-integer spin are fermions. Additionally, the graviton (G), a hypothetical elementary particle not incorporated in the Standard Model, if it exists, must be a boson, and could conceivably be a gauge boson. Composite bosons are important in superfluidity and other applications of Bose–Einstein condensates. By definition, bosons are particles which obey Bose–Einstein statistics: when one swaps two bosons, the wavefunction of the system is unchanged. Fermions, on the other hand, obey Fermi–Dirac statistics and the Pauli exclusion principle: two fermions cannot occupy the same quantum state, resulting in a "rigidity" or "stiffness" of matter which includes fermions. Thus fermions are sometimes said to be the constituents of matter, while bosons are said to be the particles that transmit interactions (force carriers), or the constituents of radiation. The quantum fields of bosons are bosonic fields, obeying canonical commutation relations. All known elementary and composite particles are bosons or fermions, depending on their spin: particles with half-integer spin are fermions; particles with integer spin are bosons. In the framework of nonrelativistic quantum mechanics, this is a purely empirical observation. However, in relativistic quantum field theory, the spin-statistics theorem shows that half-integer spin particles cannot be bosons and integer spin particles cannot be fermions. In large systems, the difference between bosonic and fermionic statistics is only apparent at large densities—when their wave functions overlap. At low densities, both types of statistics are well approximated by Maxwell-Boltzmann statistics, which is described by classical mechanics. ↑ Even-mass-number nuclides, which comprise 152/255 = ~ 60% of all stable nuclides, are bosons, i.e. they have integerspin. Almost all (148 of the 152) are even-proton, even-neutron (EE) nuclides, which necessarily have spin 0 because of pairing. The remainder of the stable bosonic nuclides are 5 odd-proton, odd-neutron stable nuclides (see isotope under "odd proton-odd proton nuclei"); these odd-odd bosons are: Àdàkọ:Nuclide2, Àdàkọ:Nuclide2,Àdàkọ:Nuclide2, Àdàkọ:Nuclide2 and [[Tantalum-180m|Àdàkọ:Nuclide2]]). All have nonzero integer spin. ↑ Wells, John C. (1990). Longman pronunciation dictionary. Harlow, England: Longman. ISBN 0582053838. entry "Boson"
↑ "boson (dictionary entry)". Merriam-Webster's Online Dictionary. Retrieved 2010-03-21. ↑ "BBC News - Higgs boson: The poetry of subatomic particles". BBC Online. 4 July 2012. Retrieved 6 July 2012. ↑ "boson". Merriam-Webster Online Dictionary. Retrieved 2010-03-21.